It’s entirely likely that micro greens garnished your plate the last time you dined out in a Southern California restaurant. They’re pretty, extremely flavorful and totally packed with nutrients. Translation: They jive really well with our region’s active and healthy lifestyles. They downside is that micro greens are expensive to buy for home use. However, in a mild climate like ours, gardeners of any level of experience can grow them inside or outside depending on space and preference. And, it only takes 1-3 weeks from start to finish depending on the variety of micro greens you choose. 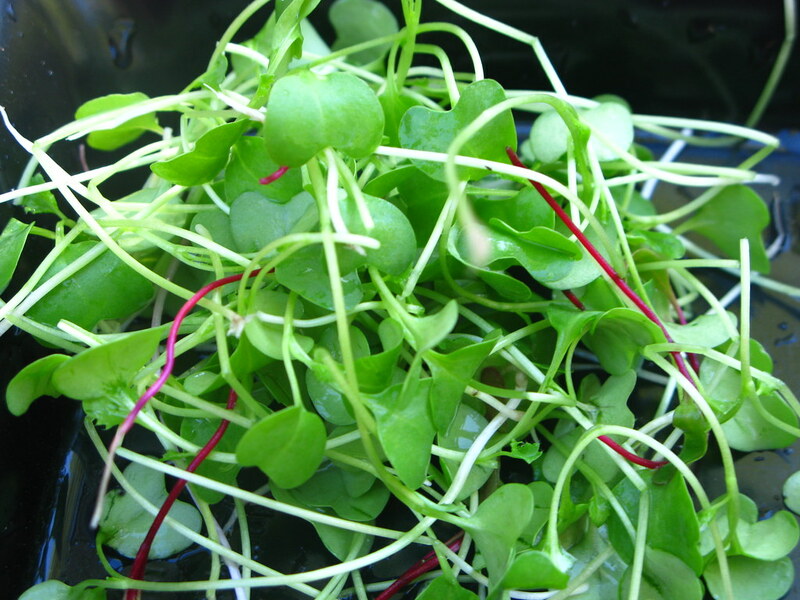 Micro greens are often confused with sprouts. Sprouts are harvested right after the seed sprouts and are eaten root, seed and shoot. 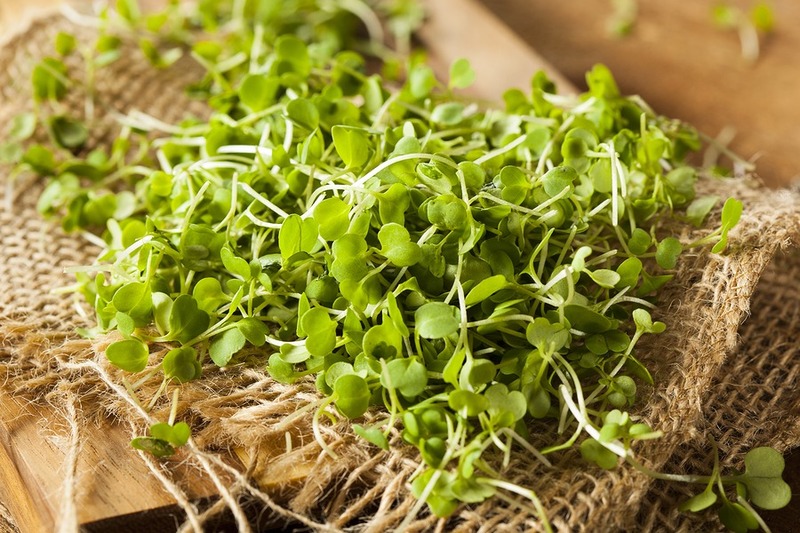 Micro greens are harvested in the next stage of development, right after a first set of true leaves form, and cut from the root ball at the base of the stem. They are basically the very young shoots of salad greens such as arugula, Swiss chard, mustard, and beetroot. Which Micro Greens Should I Grow? Really, the decision is entirely up to you. Easy first-time choices include broccoli, cauliflower, cabbage, mustard, chia, sunflower or buckwheat but since they don’t need to reach maturity, no variety is terribly difficult. Color and flavor play a role in your choice. Chard has delicate red stems and green leaves. Beets have purple leaves and an earthy flavor while purple basil is a similar color but with a spicier flavor. Mustard is also very pretty with green leaves, red veins and a spicy flavor. Leave shapes vary too, providing another layer of visual interest. A great reference is this micro greens chart which shows flavor, a photo of common plants, and color. Micro greens are forgiving because of their short growing time. Meaning, if you mess up the first time, a new batch can follow within a few weeks. After figuring out which micro greens to plant, buy seed packets. Some seed manufacturers offer mixed seed packs which germinate into an assortment of micro greens that will growing in one place. These usually are plants with the same growing rates so that they can be harvested at one time, but it doesn’t hurt to verify this. Mixed seed could be a good strategy for first-time micro green growers in order to taste which varieties are most pleasing to your palate. Methodical gardeners tend to divide a growing space and plant one type of micro green in each section. If you do this, it’s still a good idea to research growing rates so that you harvest the colors and flavors desired at one time. The upshot to choosing micro greens with different growing rates is that it’s a way to make sure you always have some at the ready. It’s a good idea to keep a log because how well your micro greens grow can depend on light, soil and temperature. If you’re choosing to plant in containers, it’s easy to move them around to see how different conditions may improve results. Micro greens only need a few inches of soil and can be grown in Southern California gardens but are most commonly planted in flat containers. Another good option is a repurposed egg carton or pie tin. Bagged potting soil works just fine as a growing medium and sprinkling in a little compost helps, too. Planting takes a little technique, too. Resist the temptation to toss a handful of seeds into one spot, otherwise you might wind up with a mat of micro greens that is far too dense, prohibiting proper air circulation and exposing your lovely greens to root rot. Try to disperse seeds as best you can and sow them at a shallow roughly 1/8 inch deep. There is some debate here as to whether covering them with dirt is necessary. Some people do and some don’t… both have success. Perhaps this is one of those things to log. Make sure the soil is moist but not overly wet. A sure sign of overwatering is if the leaves of your greens start to yellow. If using a small, shallow container, consider purchasing a mister as more controlled watering device. Place in sunlight but not scorching sunshine as these are delicate plants after all. If light is bright in your growing area, consider shading them with a perforated cloth like a burlap sack. Feed with an organic fertilizer like fish emulsion every other week. When micro greens sprout their first set of true leaves, not the initial seedling leaves, they’re good to go. 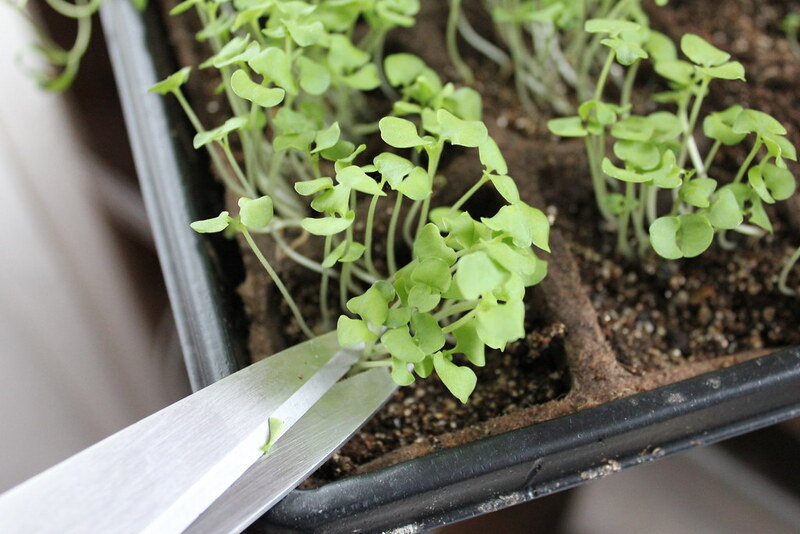 A good pair of scissors can easily cut micro greens, separating the edible part from the seed and roots. If you do use scissors make sure to sterilize them if you happened to cut any greens that may have fungus. However, ceramic scissors are thought to be the best choice as they prevent the ends of the micro greens from turning brown after cutting. Alternatively, some gardeners choose to simply pluck the entire plant out of the soil and then cut the roots off in the kitchen. The latter might be a better choice depending on how your micro greens are planted and if you don’t want to leave a root ball in the soil which may interfere with micro greens not yet harvested. Because they grow so quickly, you may find yourself in a situation with more micro greens than you can eat in one sitting. The best way to store them is by wrapping them loosely in a damp paper towel in a way that allows a bit of air circulation. Seal them in a zippered plastic bag and place it in the refrigerator. They should last this way for about a week. When serving, keep the micro greens wrapped up until placement on the plates as they will wilt if allowed to dry out. Which micro greens do you grow at home?